The Gallery’s collection of art from the ancient Americas comprises approximately 1,500 objects, crossing cultural boundaries from the Olmec to the Inca and spanning more than 2,500 years. Its strength lies in the art of the Maya and their predecessors. The collection also includes strong representative holdings from Costa Rica, West Mexico, and the Andean regions. 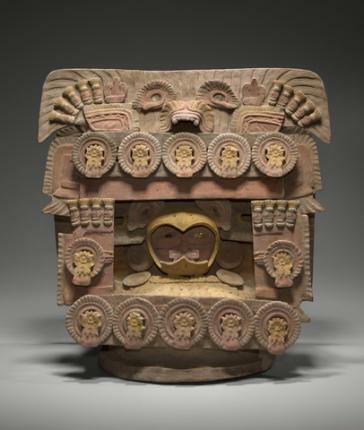 The Yale University Art Gallery’s collection of art of the ancient Americas explores the richness of art from ancient Mesoamerica to the Central Andes, and spans more than 2,500 years from the Olmec culture to the Contact-era Aztec and Inca Empires. Inspired by Yale professor and pioneering art historian George Kubler, the Gallery began collecting ancient American art in the 1950s, with a gift from Mr. and Mrs. Fred Olsen. The Olsen collection provided a representative base of Mesoamerican art and established the strength of the collection in the art of the Maya and the cultures of West Mexico, including outstanding Maya ceramic figurines from Jaina Island and striking sculptures and house models from West Mexico. The collection has grown, fostered by Mary Miller, the Sterling Professor of Art and Senior Director of the Institute for the Preservation of Cultural Heritage, with a special focus on the Maya and the Mesoamerican ballgame, including a rare ceramic model of a ballcourt, figures of ballplayers, and ballgame paraphernalia. Recent acquisitions include a portrait of an elite Maya woman rendered in painted stucco, notable Olmec and early Maya pieces, and major donations of antiquities from Costa Rica and the Central Andes. Several important objects from the Yale Peabody Museum of Natural History, formerly curated by renowned Mesoamericanist and Yale professor Michael D. Coe, the Charles J. MacCurdy Professor Emeritus of Anthropology, are currently on view in the Cornelia Cogswell Rossi Foundation Gallery of Art of the Ancient Americas. The Mesoamerican collection encompasses the region’s major artistic traditions, including the Aztec, Gulf Coast, Maya, Mixtec, Olmec, Teotihuacan, West Mexico, and Zapotec. Mesoamerican artists represented ancestors, animals, deities, and rulers in a variety of materials, including bone, ceramic, shell, stone, and stucco. Incense burners served as a vital means of contacting deities and ancestors through offerings of aromatic resins, and vibrantly painted ceramic vessels, used for feasting and drinking cacao, show mythological scenes and offer glimpses into courtly life and scribal traditions. The Gallery’s collection of jades showcases the skill with which Olmec and Maya carvers rendered hard precious stones into graceful objects without the benefit of metal tools. Other highlights include a rare imperial Aztec altar that portrays the rhythmic creation and destruction of the cosmos, a monumental portrayal of a fanged and goggle-eyed rain god from the Gulf Coast, and an exceptional head of Xochipilli-Macuilxochitl, the Aztec god of games, music, and drunkenness. Objects from the diverse traditions of the Central Andes, such as the Chavín, Inca, Lambayeque, Moche, Nasca, Paracas, and Wari, enrich the display. In contrast to the humid tropical climate of Mesoamerica, the extreme dryness of the Andean coast favored the preservation of beautiful and elaborate textiles of unparalleled quality. Inca priests and rulers left intricate gold and silver figures, originally clothed in miniature textiles, on the snow-capped summits of the Andean cordillera as offerings to gods and ancestors. Coastal Nasca and Moche peoples gave offerings of painted and sculptural ceramic vessels, which were prized for their inventiveness and detail. Gold, ceramic, and wooden vessels for drinking and pouring offerings of maize beer solidified bonds among the living and ultimately embellished royal tombs. Among the many striking objects on display are a Lambayeque gold crown, exquisite miniature textiles, and a pair of lifelike Moche portrait vessels. An exceptional ceramic censer lid, recently donated to the Art of the Ancient Americas collection, graces the entryway of the newly reinstalled Cornelia Cogswell Rossi Foundation Gallery. In ancient Mesoamerica, the burning of aromatic offerings was a vital means of engaging with supernatural powers. This elaborately decorated lid, although reminiscent of objects from Teotihuacan, Mexico, is likely from Escuintla, Guatemala, where artists worked in a similar but decidedly livelier and less standardized style. It showcases a human figure, undoubtedly a deceased warrior, dressed as a bird with yellow feathers and diminutive wings. Framed by a pair of rectangular shields, he stares out from the costume’s open beak with radiant eyes of inlaid mica. His avian costume and stylized butterfly-shaped nose ornament suggest that, like the later Aztecs, Escuintla’s ancient inhabitants believed that the souls of those who fell on the battlefield became colorful birds and butterflies that dwelled in a flowery paradise. The dazzling enclosure that surrounds the figure may represent a type of decorated wooden framework that housed the body during cremation. When the censer was used, the billowing clouds of smoke pouring out of it would have evoked the act of burning the deceased warrior; it would also attract his spirit—in the form of a nectar-drinking bird or butterfly—to the sweet aroma of incense. Susan B. Matheson, the Molly and Walter Bareiss Curator of Ancient Art, oversees the collections of art from the ancient Mediterranean and ancient Americas. She has organized exhibitions on Greek vases, Dura-Europos, and Neoclassical and Gothic Revival Art, and she was cocurator of the exhibition I, Claudia: Women in Ancient Rome in 1996. Her books include Polygnotos and Vase-Painting in Classical Athens, volumes on Yale’s Athenian vases and ancient glass, and Art for Yale: A History of the Yale University Art Gallery. She teaches courses on Athenian vase painting for the departments of Classics and the History of Art at Yale. Lisa R. Brody, Associate Curator of Ancient Art, received her B.A. from Yale and her PH.D. from the Institute of Fine Arts at New York University. She has excavated around the Mediterranean and on Yale’s campus, and her publications include Aphrodisias III: The Aphrodite of Aphrodisias. In 2011 she cocurated Dura-Europos: Crossroads of Antiquity, which was on view at the McMullen Museum at Boston College and at the Institute for the Study of the Ancient World at New York University, and she coedited the accompanying book. She most recently cocurated Roman in the Provinces: Art on the Periphery of Empire and coedited the exhibition catalogue. Kubler, George, ed. Pre-Columbian Art of Mexico and Central America. New Haven: Yale University Art Gallery, 1986. Miller, Mary Ellen. The Art of Mesoamerica: From Olmec to Aztec, rev. ed. London: Thames and Hudson, 1996. Miller, Mary, and Karl Taube. An Illustrated Dictionary of The Gods and Symbols of Ancient Mexico and the Maya. London: Thames and Hudson, 1997. Stone-Miller, Rebecca. Art of the Andes: From Chavín to Inca. 2nd ed. London: Thames and Hudson, 2002. Whittington, E. Michael. The Sport of Life and Death: The Mesoamerican Ballgame, exh. cat. Charlotte, N.C.: Mint Museum of Art, 2001. Young-Sanchez, Margaret, et al. Nature and Spirit: Ancient Costa Rican Treasures in the Mayer Collection at the Denver Art Museum. Denver: Denver Art Museum, 2010.